From August to December, Sunbelt Greenhouses provides a constant stream of color in an ever-increasing variety of fall crops: 8-04 cell pack annuals and vegetables; 4" Papa Joe's™ herbs; potted annuals and accents in trays; as well as hanging baskets, planters and bowls. Our mums are grown in outdoor fields to ensure full, bushy plants that will look incredible in the retail environment. We typically ship mums when they begin to "crack" color so the consumer can fully enjoy their bloom time. Pansies and Violas ship from mid-October to December and are available in three sizes and price points. 8-04 Pansies and Violas continue to be bestsellers. We offer more than 50 varieties. 8-04 Cell Pack Vegetables now include cool-season greens like spinach, kale and lettuce, plus broccoli, cauliflower and cabbage. 4" 10-pk Papa Joe's Herbs are available in delicious fall flavors, such as fennel, oregano, rosemary, sage and thyme. Basil, chives, mint and parsley round out the collection. 8" Herb Combos include three combinations full of delicious herbs in a grower pot. Herbs include basil, sage, oregano, parsley, rosemary, and more. 12" Galvanized Herb Combo includes five different herbs in a decorative, oval-shaped galvanized container. 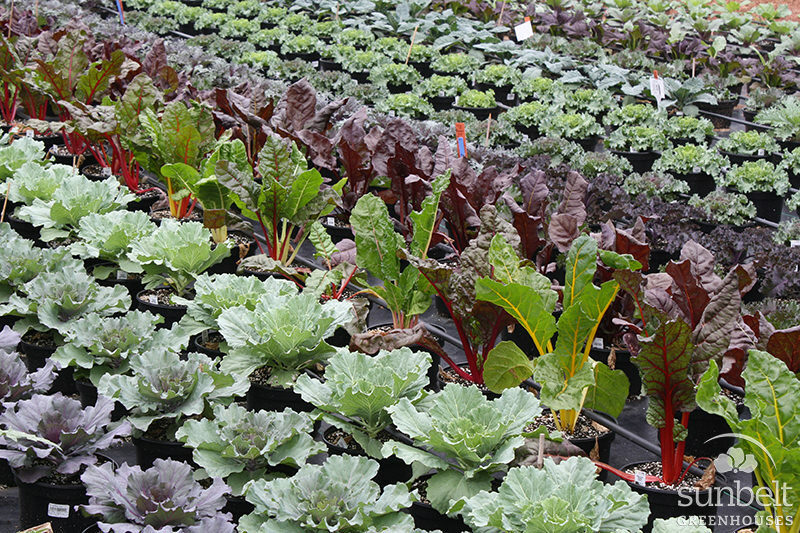 4.3" 10-pk, 5.5" 6-pk and 8" Accents are ornamental cabbages, kales, Swiss chard and Red Giant mustard. These plants are among our most popular fall crops. 1-quart 8-pk Accents include grasses and other interesting textural plants. 1-quart 8-pk Heuchera is available in rich fall colors. 5" 8-ct Ornamental Peppers are increasingly popular, and our selection includes unusual varieties like Black Pearl, Purple Flash and Salsa™ Deep Orange. New varieties are Hot Pops and Sedona Sun. 6.5" 6-pk All About Color Select is our newest annual program for fall, featuring bestsellers like Jolt™ dianthus, Hot Pak™ marigolds, Speedy Sonnet™ snapdragon, and Profusion™ zinnias. 6.5" 6-pk Gerbera Garvinea® is offered this fall with four popular varieties in the Sweet series. These gerberas are very florific in cool temps and perennial up to zone 7. 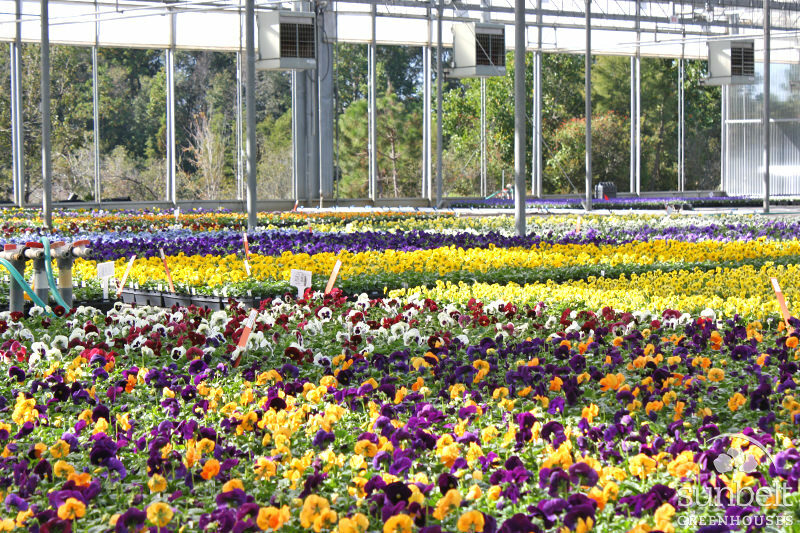 3.5" 18-pk and 5.5" 6-pk Pansies and Violas are incredible for cool-weather color. Our tremendous variety selection translates into happy customers. 3.5" 18-pk Accents are the perfect "filler" and "spiller" components in mixed annual containers. They also provide interesting textures and shapes. 3.5" 12-pk Succulents and 4" Ornamental Wintergreens are now part of our fall program. 4.25" 10-pk Cool Wave™ Pansies and 4.3" 10-pk Cyclamen provide color that will last through colder temperatures. 4.3" 10-pk All About Color Select include fall flowers like alyssum, cosmos, delphinium, digitalis, marigold, and snapdragon, all priced to move. 4.3" (deep) 10-pk and 6.5" 6-pk All About Color Premium are our most popular annual programs and feature superior plant genetics. 12" and 12.5" Combo Planters in fall tones help to fill the need for grab-and-go purchases. 14" Winter Conifer Gardens will ship in mid-November for cool-season sales. Two combos feature cypress, gaultheria, variegated false holly, compact kale, and viola. 6.5" Galvanized Pail and 6.5" Galvanized Watering Can Combos come complete with unique fall combinations! These combos feature pansies, dianthus, marigolds, herbs, violas, and more! 10" Succulent Bowls feature two different combos in a decorative square container. 10.5" Planters are available in popular monocultures and five outstanding combos, housed in a trendy gray embossed planter. 11" Hanging Baskets remain popular for fall. This year's production includes a good selection of Cool Wave™ Pansies and Candy Showers trailing snapdragons in addition to several combos and a new Burgundy Calliope® geranium. Boston ferns and Asparagus sprengeri are also on the production lineup. Our 9" Garden Mums are especially beautiful and often preferred by the more discerning IGC customers. A limited number of 12" Garden Mum Deco Planters are also available. 1-quart 8-pk Garden Mums are perfect for mixed containers and for grouping together. 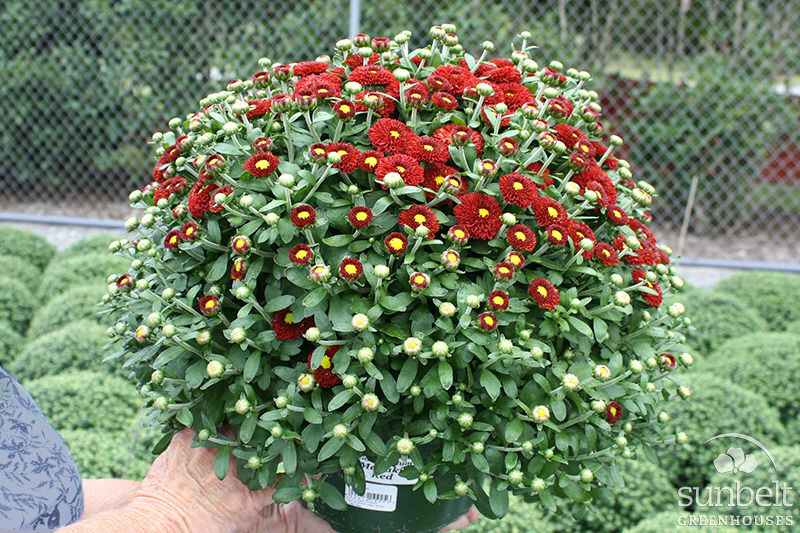 Our 8" Garden Mums are an "industry standard" container size, but they are beautifully shaped as well as full and lush.